Vitamin A, also known as retinol, is a fat soluble vitamin that comes in two forms: preformed and provitamin A carotenoid. The first is found in foods originating from animals such as liver, whole milk and fortified food products. It is absorbed as retinol but is later converted into retinal and retinoic acid by the body. 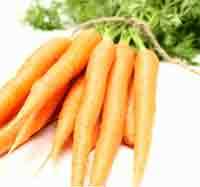 However, provitamin A carotenoid is absorbed from foods originating from plants such as fruits and vegetables. This is then converted into retinol. There are currently 563 known carotenoids, however less than ten percent of them can be converted into Vitamin A once in the body. Nevertheless, there are three main carotenoids that are found in plants; beta-carotene, alpha-carotene and beta-crytoxanthin. Retinol is commonly found in animal products such as milk, butter, egg yolk and liver and in plant products such as dark green leafy vegetables, fruits, broccoli and carrots. More information is given in the table below. Vitamin A has many functions. Firstly, it is known for improving eye sight, particularly in the dark by allowing the retina to adapt to darkness. However, it also helps regulate and strengthen the immune system. Furthermore, it helps our bodies protect themselves by building up mucous membranes in areas such as the throat, nose and lungs which act as barriers. This vitamin also promotes healthy bone growth, cell division, reproduction, cell differentiation, healthy surface linings of the eyes, and healthy respiratory, intestinal and urinary tracts. By maintaining the health of these various organ systems, it becomes more difficult for bacteria to enter our bodies and cause infection. Therefore, this vitamin is essential for our health. Furthermore, it protects us against air pollutants and is involved in the synthesis of certain hormones such as progesterone. Because it is an antioxidant, Retinol has various anti-ageing properties such as the prevention of damage to cells and wrinkles. It has also been shown to delay the onset of senility and promote healthy digestion. It is also one of the main ingredients in many topical skin creams as retinol and retinoid enhance skin cell replacement. Furthermore, this vitamin has been shows to increase collagen levels along with skin elasticity and stretch ability. These factors combined lead to smooth skin, fewer wrinkles and fine lines and reduction of bad pigmentation and acne. Despite Retinol’s multiple benefits, it is known for making skin more sensitive to sunlight. This increases the risk of damaging the skin cells when exposed to the sun. However, this can be counterbalanced by applying sunscreen in generous quantities when being exposed to the sun. In order to avoid any of these symptoms, it is recommended that we ingest only 900 RE (retinol equivalents) per day.